LIMA, Peru (CNN) -- Manuel Rosales, the mayor of Maracaibo, Venezuela, has been granted political asylum in Peru, Peru's foreign minister said Monday. Manuel Rosales denies that he illegally enriched himself as governor of Zulia state. Rosales, a leading political opponent who lost the 2006 presidential race to Hugo Chavez, faces corruption charges in Venezuela. He was supposed to have turned himself in to authorities last week but failed to appear. His attorney said then that Rosales had fled to Peru and would seek asylum there. Peruvian Foreign Minister Jose Antonio Garcia Belaunde said that the asylum was granted on humanitarian grounds and that recent statements by Rosales against Venezuelan President Hugo Chavez were not taken into account, the state-run Andina news agency said. Venezuelan officials say Rosales illegally enriched himself as governor of Zulia state from 2002 to 2004. Rosales denies the allegation, saying Chavez is out to get him for political reasons and is persecuting him on trumped-up corruption charges. "Since they haven't been able to take me off the political map by the electoral route, now they're using the power they have in all the movements of the public prosecutor," Rosales told CNN en Español last month. One of Rosales' lawyers noted that Chavez said publicly in October 2008, before Rosales was charged, that he wanted the mayor in prison. In last month's interview, Rosales called the charges that he had illegally accepted money "totally false," and said he not only declared all of his income, but paid taxes on it. Katiuska Plaza, district attorney for Zulia state, said in a 26-count complaint last month that Rosales illegally enriched himself in 2002 and 2004. Rosales called the district attorney's actions "a manipulation," and said the prosecutor "is acting on Chavez's orders." Another prominent Chavez opponent was arrested this month on corruption charges. 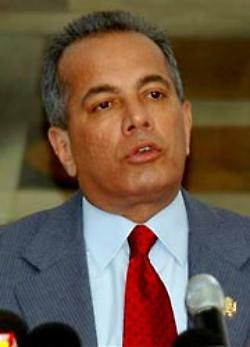 Former Venezuelan Defense Minister Raul Baduel played a key role in turning back a coup attempt against Chavez in 2002 but broke with him in November 2007 over constitutional changes Chavez was proposing. Baduel has been a strong Chavez critic since then. Baduel, who also was the president's military general-in-chief, was arrested at gunpoint in front of his wife April 2, the general's attorney said at the time. It was Baduel's second arrest on charges that he stole $14 million from the armed forces. He has denied the allegation and said last year the charges were politically motivated. And Antonio Ledezma, an opposition figure who is mayor of Caracas, is finding his powers reduced. Last week, the pro-Chavez National Assembly shifted many of his powers to the federal government. Ledezma has accused Chavez of orchestrating protests against him. Reich, who also served as a special envoy and diplomat under President Reagan and both Presidents Bush, said it was an embarrassing mistake for Obama to be photographed accepting an America-bashing book from the Venezuelan strongman. Newsmax.TV’s Ashley Martella noted that photographs snapped at the weekend’s Summit of the Americas in Trinidad and Tobago showed Obama hobknobbing with Chavez, shaking hands, and smiling with the Venezuelan, and asked for his take on that. “I think it’s very unfortunate. I don’t think President Obama really understands, perhaps out of lack of experience in international affairs, the importance of symbolism,” said Reich, who was policy adviser on Latin America for John McCain’s presidential campaign. Martella asked whether people will “misinterpret” those photos. Reich responded that the pictures certainly are being misinterpreted in Venezuela “despite what President Obama wishes. I think he probably realizes now that he made a mistake. Chavez is seeking to “portray this warm handshake, and a slap on the back which came later, as an endorsement of Chavez, which I’m sure President Obama did not intend,” Reich said. Martella referred to photos of Chavez giving Obama an anti-American book entitled “Open Veins of Latin America,” which Obama accepted and posed with for the cameras, and asked whether that was a mistake on Obama’s part. “Absolutely it was a mistake,” Reich declared. “It was also frankly a mistake by the staff. They should have prevented that. “I worked for three presidents. I don’t think that would have happened with President Reagan or either one of the President Bushes. They should not have put President Obama in that embarrassing situation because this is very much an anti-U.S. book. Anti-Europe as well. Reich, who was born in Cuba, was asked to comment on assertions from opponents of the trade embargo with Cuba that hurting the Cuban people is counter-productive. “Hurting the Cuban people is counterproductive, and that’s why we should do everything we can to see a regime change in Cuba,” Reich said. “The Cuban people have been hurt by 50 years of Marxist-Leninist dictatorship. It’s not the U.S. embargo that has hurt the Cuban people. Castro can trade with 175 countries in the world. It’s only the United States that doesn’t trade with him directly. “In fact we are the single largest provider of food to Cuba. We provided $700 million in food to Cuba last year, more than anybody else — in fact more than the next several countries combined. Sunday marked the conclusion of the Summit of the Americas in Trinidad and Tobago. This meeting could have offered a valuable opportunity to stand up to the region's despotic leaders who claim that their radical visions -- rather than the voice of the people -- should usher in a new age in our hemisphere. It could have offered an opportunity to move forward on further agreements toward the realization of the Free Trade Area of the Americas. But that was not to be. With U.S. Secretary of State Hillary Clinton set to appear before the House Committee on Foreign Affairs on Wednesday, it is critical that we press for the United States to advance a vigorous agenda that reflects America's long standing commitment to freedom and democracy as the bedrock of our policy in Latin America. Democratic institutions in the hemisphere are under increasing assault from internal and external actors. Nicaragua's November municipal elections were widely recognized as illegitimate. In Venezuela, President Hugo Chávez has moved beyond attacks on property rights and freedom of press to an explicit and concerted campaign against his opposition. Bolivia and Ecuador have resumed their baseless accusations against the United States and continue to advance their authoritarian agendas. Preying on the anti-American and anti-democratic sentiment promoted by the regimes of these countries, a realignment is taking place with rogue regimes such as Iran and Cuba. Using Chávez as his personal broker, Iran's Mahmoud Ahmadinejad has joined forces with several of the above-mentioned countries to denounce U.S. democratic standards and threaten regional security objectives. This planned assault on core democratic values and free market principles continued at the summit. Even responsible nations failed to counter the paltry moral equivalency arguments raised by repressive leaders and their enablers. In fact, the summit discussions remind me of the farcical Durban 2 Conference taking place this week in Geneva. These forums have been hijacked by repressors, tyrants and regime leaders who deprecate democratic principles and ideals. Several countries in the region used the summit to advocate, not for the rights of the Cuban people, but for the Cuban regime's undeserved return to the inter-American system. But the United States must not allow the picture of this hemisphere to be painted by those who despise liberty, nor by those who wish and work to do us harm. Rather, we must stand up for freedom and make support for our democratic allies the central tenet of our policy in the Western Hemisphere. Security issues throughout the region are having a direct impact on the ability of responsible nations to advance democratic principles. From narcotrafficking to organized crime, Islamic radicals to the FARC in Colombia, and the influence of tyrannical regimes from Iran to Syria, the hemisphere is in critical need of a comprehensive model of partnership and responsibility that binds leaders to the obligations outlined in the Inter-American Democratic Charter and other such accords. The United States must not falter in our expectation that countries we work with adhere to these values. Programs like the Millennium Challenge Corporation Compacts should be leveraged to ensure Americans are getting a return on our investments in the hemisphere. In the aftermath of the summit, it will be up to Secretary Clinton to implement the U.S. agenda and up to the Congress to decide where taxpayer funds are most needed. With great economic challenges at home, we must ensure that our resources are focused on strengthening, supporting and empowering our democratic allies, rather than wasted on efforts that only benefit tyrants and oppressors. U.S. Rep. Ileana Ros-Lehtinen, R-Miami, is the ranking member of the House Foreign Affairs Committee. Chavez told Obama= I want to be your friend. But what about Venezuelans Humans Rights? What about fair elections in Venezuela? What about Chavez changing laws in Venezuela and his dictatorship? From distant lands the evaluation of Latin American political leadership is too often made on the basis of grasping the shadows, rather than the substance. The flamboyancy of Hugo Chavez, his aggressive rhetoric, his prodigality with ideological friends, his hatred of the United States, all of this is the shadow. The substance is that he has pilfered $750 billion in ten years, that the country has been deeply divided along racial and class lines, that all national institutions have been prostituted, that crime and corruption are rampant and that the population is not better off than ten years ago. Faced with these objective truths Chavez’s fellow travelers, from Ramonet in France to Gott and Carson in the U.K., to Weisbrot, Birns, Sean Penn and Danny Glover in the U.S., to Heinz Dieterich where he might be, prefer to ignore them in order to applaud the shadow, the illusion of a man who is “doing good things for the poor”. These fellow travelers would not be so despicable if they accepted openly that they let their emotions or their greed prevail over their integrity. But they all claim to be sincerely convinced that a man like Chavez represents a hope for Venezuelans and for humanity. In doing this they refuse to accept that the man is undemocratic (hasn’t he won several elections? they claim, without seeing that the electoral events are deeply corrupted)), that he pretends to be president for life (why shouldn’t he? ), that he only sees corruption among the leaders of the opposition but not among the members of his own family and friends (the biggest gang of thieves in Venezuelan modern history), that he uses national assets a if they were his own (abuse of power). They do not hear when Chavez says: “I am the only one who can govern Venezuela”, or when he insults political dissidents or the very own political leaders of their countries in Tarzan-like language (“Bush: u ar a donky”). All of these attitudes do not seem to matter to the fellow travelers, who can only see in him the man who insults the “empire” and gets away with it, the great hope of a vague “socialist” utopia that no one can define. Aesop’s warning assumed that grasping at the shadow was an involuntary human action. He never suspected that there would be people that would do it consciously, fueled by greed or lack of intellectual honesty. Help Rescue Venezuelan Political Prisoners, from Chavez Government. Groundless pre-trial incarceration and denial of bail. Ivan Simonovis, Lazaro Forero and Henry Vivas: Police deputies on duty during the April 11, 2002, events that briefly removed Chavez from power. Convicted of homicide. Francisco Uson: Retired General resigned as Secretary of Finance during April 11, 2002, events. Convicted of revealing military secrets. Otto Gebauer: Air Force Captain ordered to transport Chavez to provisional detainment during April 11, 2002, events. Convicted of kidnapping the president. Otoniel, Rolando and Juan Guevara: Police officers convicted of murdering a District Attorney based on paid false testimony. Nixon Moreno : College student who led youth opposition movement. Accused of attempted sexual assault against a policewoman. Granted asylum by the Vatican . Humberto Quintero: Lt. Colonel who captured and returned FARC leader to Colombian government. Convicted of treason. Felipe Rodriguez: General who spoke out against Chavez and led others to follow. Convicted of military rebellion. Jose “Maraco” Dacre: Citizen who assisted student movement. Accused of public insurgence. FOREING GOVERNMENTS CAN HELP BY CONDITIONING DISCUSSIONS WITH THE CHAVEZ GOVERNMENT ON RESTORATION OF HUMAN RIGHTS AND THE RULE OF LAW IN VENEZUELA .